9/11 and its aftermath have shown that our ideas about what constitutes sovereign power lag dangerously behind the burgeoning claims to rights and recognition within and across national boundaries. New configurations of sovereignty are at the heart of political and cultural transformations globally. 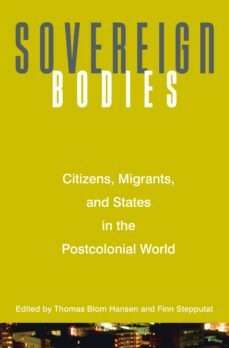 Sovereign Bodies shifts the debate on sovereign power away from territoriality and external recognition of state power, toward the shaping of sovereign power through the exercise of violence over human bodies and populations. In this volume, sovereign power, whether exercised by a nation-state or by a local despotic power or community, is understood and scrutinized as something tentative and unstable whose efficacy depends less on formal rules than on repeated acts of violence. Following the editors introduction are fourteen essays by leading scholars from around the globe that analyze cultural meanings of sovereign power and violence, as well as practices of citizenship and belonging--in South Africa, Peru, India, Mexico, Cyprus, Norway, and also among transnational Chinese and Indian populations. Sovereign Bodies enriches our understanding of power and sovereignty in the postcolonial world and in "the West" while opening new conceptual fields in the anthropology of politics. The contributors are Ana María Alonso, Lars Buur, Partha Chatterjee, Jean Comaroff and John L. Comaroff, Oivind Fuglerud, Thomas Blom Hansen, Barry Hindess, Steffen Jensen, Achille Mbembe, Aihwa Ong, Finn Stepputat, Simon Turner, Peter van der Veer, and Yael Navaro-Yashin.